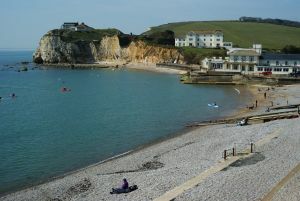 With the exception of the Isles of Scilly, the Isle of Wight is unique in being part of England yet accessible only by water. Yes, it does have two very small airports, but no scheduled services. It covers an area of 150sq miles with 57 miles of coastline. The island resorts have been holiday destinations since Victorian times. It is known for its mild climate, coastal scenery and a pretty landscape of woodlands, agricultural fields, downland and chines. The Isle of Wight is a county in its own right and elects an MP to Parliament (Bob Sealy – Conservative). Crossings can be made across the Solent from Lymington, Southampton and Portsmouth. 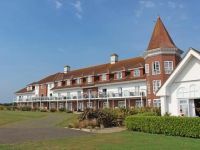 We purchased a weekday break package from Warner Holidays at its Bembridge Coast Resort which included a Red Funnel return trip from Southampton to East Cowes, and was not dependent on car size. Loading at both ends could not be easier and we took advantage of the £10 upgrade to the Signature Lounge with an inclusive selection of beverages and refreshments. Children under 12 are not allowed. If your arrival is at Ryde, you can take a genuine 1938 London Tube train to Shanklin to start your holiday. You will pass through Smallbrook Junction Station, which is the start of the Isle of Wight Steam Railway and a 5.5 mile track to Wootton. You can only join the steam train by the "Tube" at Smallbrook. There is no access by road or foot. The main station is at Havenstreet with a visitor centre, carriage and wagon workshop, museum and refreshments. Warner Leisure Hotels offers an all-inclusive half-board package at Bembridge (and all its other UK properties). In many ways, it is similar to a deep-sea ship cruise with top-class entertainment in the evening, facilities such as a large indoor pool, indoor and outdoor bowls, and bookable tours. There is a Midweek Entertainment Guide and one for the weekend too, both listing a comprehensive programme that starts at 09:00 and goes on to the late-night show. It was our base for an intensive three-night stay. It is a 15 mile drive from East Cowes or 45 minutes. But do not rush. The Isle of Wight is leisurely. The distance is less from Ryde, a pretty little town, and it is worth a visit in any event. There are 258 rooms and suites, many with patios or balconies. Forty brand new bedrooms have just been added. The restaurant is flexible with timings but you do have an allocated table, ideal for your waiter getting to know your likes and dislikes. The rooms are all nice, but go for one facing the sea. In the morning, the bright easterly sunrise starts the day off well. In the evening, it does not matter. If you want privacy, there are a number of garden suites. At the other end of the island at Yarmouth is Warner's Norton Grange chalet resort, just outside the village, with a nine-hole pitch-and-putt golf course attached. When it comes to eating, more than 120 pubs and bars are listed on the island. Year-round there are restaurants serving quality food. Most high streets have a number of such places – and in some towns it is difficult to make a choice. Cowes has a range of different dining styles, and especially in the summer there are often temporary or pop-up restaurants. The Isle of Wight has a programme of events that starts with the Children’s Festival in April right through to the Wight Proms later this month and a special Alice in Wonderland show at Osborne House on 21 August. The International Classic Car Show takes place at Newport on 15 September and Ryde on 16 September). Cowes Week has now completed for this year. If you are not into yachting, keep away between 10 to 17 August next year. Cowes Week is one of the longest-running regular regattas in the world with 40 daily sailing races, up to 1,000 boats and 8,000 competitors ranging from Olympic and world-class professionals to weekend sailors. Dating from 1826, it is the largest sailing regatta of its kind in the world. Ours was an effective two-night stay. The Isle of Wight is one of those British holiday destinations that deserves more time and an opportunity to try some of the highly-rated dining opportunities.